The Megulla® Rechargeable Li Battery-Operated Wireless Motion Sensor Light offers a simple solution to lighting anywhere in your home. The compact and detachable design makes it versatile and flexible enough to be used as a night light in hallways and staircases or as a under cabinet or pantry light for dark areas. Installation is in seconds, just peel and stick, and your LED motion sensor light is ready for use. When ambient is dim (<5 LUX, no need for full darkness), the light will automatically turns on once it detects motions; when no movement is detected for about 30 seconds, the light will automatically turn off. 1.The light has built-in light sensor so it will not light up in the bright environment. 2. Do not install the light in wet, high temperature area or near vent as the sensor may not function properly. 3. If the light becomes dimmer or the sensor is not sensitive enough, please recharge it. Blue light indicates charging and red light indicates finish. 4. The key feature of Megulla motion sensor light is motion mode (mode3&mode4) for conserving energy. If you prefer to use the "ALWAYS ON" MODE(Mode2) constantly, please note its battery life in mode2 can last for 4-5 hours. 【Super-Bright& Energy-Efficiency】It delivers softer and glare-free light at a wider angle, thanks to the superior lampshade material from Mitsubishi. Compare to traditional bulbs, the LED has a lifespan of over 30,000 hours with minimal power consumption. 【Motion-Activated】The light automatically turns on when motion is detected in low light and darkness and turns off in 30 seconds if no more motion within the sensing range, it activates only in darkness to conserve energy. Smart PIR sensor offers 10ft, 120-degree sensing range and 30s-timer for dependable performance. 【Rechargeable-Battery】Built-in Lithium Battery can be charged by USB charging cable (included), No more costly battery replacement. One single fully-charge can last for up to 400 times of sensing at full brightness and 1000 times at 40% brightness. 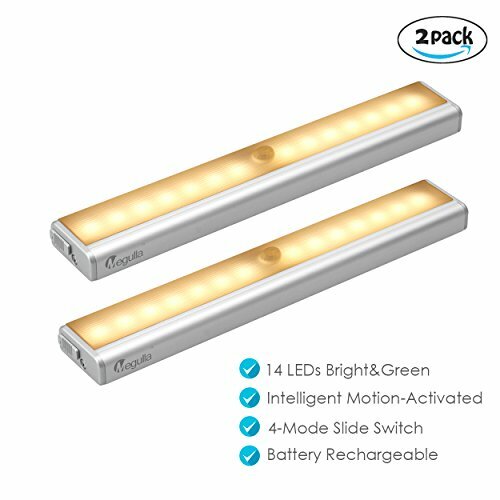 【Intelligent 4-Mode Switch】Compared with most motion-activated lights in the market, our unique power-saving function delivers more lighting time after one single charge, and you can even use it as portable flashlight in emergency. View More In Under-Cabinet Lamps. If you have any questions about this product by Megulla, contact us by completing and submitting the form below. If you are looking for a specif part number, please include it with your message.